Beyond Boundaries is an Arts Enrichment Program geared specifically toward students of all ages with special abilities. • To encourage each student's development of fine and gross motor coordination, self- confidence, and an enthusiasm for the arts; fostering creativity based on each student’s individual capabilities and expression. • Our instructors have been partnering with students and families with mixed abilities for nearly a decade, helping students to convey their emotions through music, dance, and other arts; while encouraging social, physical, and intellectual development in their students. • At CDMA, we provide a fun, safe and nurturing environment in which students can explore the world of arts education at their own level. Each week, you can expect to be presented with new challenges that help explore and develop artistic expression. If you have any further questions, please feel free to call the office at 489-5678 or stop by our studio at 1030 Huston Street, Suite C in Grover Beach. You are always welcome to come observe a class as well. The Beyond Boundaries program was created to offer a full range of artistic movement expression for dancers and musicians with Autism, Downs Syndrome, ADD/ADHD, limited ranges of motion* and a blend of other abilities. 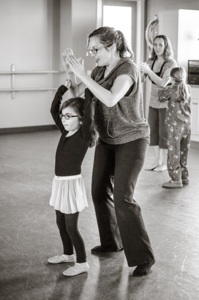 Students will explore creative movement with roots based in ballet and jazz, which will be enhanced with music, props and story-telling; encouraging each student's development of fine and gross motor coordination, self- confidence, and an enthusiasm for the arts through a sensory experience. *If your child uses an aide for mobility please inquire with the office for specific class placement.